Black Friday and Cyber Monday have both come and gone, but there are still deals to be found throughout the holiday shopping season. We pointed one out yesterday for an MSI laptop with a GeForce GTX 1060 (it's since gone up $100, though it's still a good deal), and today we found a Linksys WRT1900ACS router selling at a deep discount. Amazon has it marked down to $156 in the U.S., a 38 percent savings over its regular price of $250, and £130 in the U.K. down 43 percent. 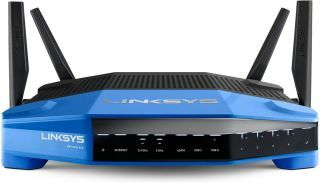 This is the latest version of the Linksys AC1900 router. It's a dual-band model capable of up to 1,300Mbps on the 5GHz band and up to 600Mbps on the 2.4GHz band, hence its AC1900 rating (note that you can't actually combine both bands, this is just how router makers market their hardware). The WRT1900ACS is powered by a 1.6GHz dual-core ARM processor. It has 128MB of flash and 512MB of DDR3 RAM. One of main appeals of this model is that it supports open-source firmware. Signal strength is really good on this model thanks to four removable antennas. It also boasts a USB 3.0 port, an eSATA/USB 2.0 combo port, and four GbE LAN ports.